Daily file photoSean Cavins, of Sahn Tae Kwon Do, demonstrates self-defense techniques with Cathy Luc at the Breckenridge Recreation Center in a 2010 class. 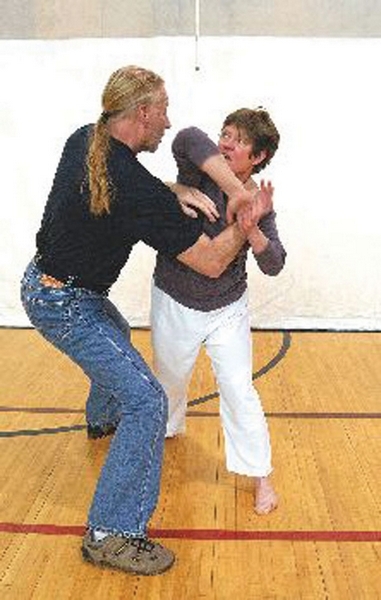 Senior master instructor Sean Cavins from Sahn Tae Kwon Do is offering self-defense classes for women for the fith year in a row at the Breckenridge Recreation Center tomorrow. Proceeds from the class will benefit Advocates for Victims of Assault, a local nonprofit that supports victims of domestic violence. Tracey Roach, a board member for the group, had the idea of offering self-defense classes. She’s been practicing tae kwon do with Cavins for 18 years. Cavins has been training in martial arts, specifically tae kwon do, for the past 43 years. With the help of his female instructors, he plans to teach basic self-defense moves to women of all ages. The moves he teaches are ones that anyone can learn, he insists, because they use gross motor skills, which are movements that people use in everyday life. The goal, he said, is to make the training as simple and understandable as possible – unlike the fine motor skills training needed for martial arts like tae kwon do. The class will take place at the recreation center from 7-9 p.m. There is no set cost for the class, though a donation of $20 is suggested.